Excited to read about the setups on EUR/GBP? First, I suggest you go through my introductory post on the Weekly Winner to give you a better understanding of my trading framework. I never got the pullback I wanted on GBP/JPY and I was left with no triggered trades last week. As it turns out, I should have paid a little more attention to another pound cross pair, EUR/GBP, as there were actually two really sweet short setups on it! After trading in a range as tight as Big Pippin‘s slim fit jeans, EUR/GBP broke to the upside on Wednesday as the pound was weaker across the board thanks to the dovish MPC meeting minutes. The pair made its way up to the PWH and top WATR at .8792 before encountering tough resistance. The pound recovered on Thursday to push ahead of the euro, but the .8720 price area proved to be a solid resistance-turned-support point. We then saw one final test of the PWH/top WATR combo, which held like a charm. At the end of the week, EUR/GBP closed just above .8720. By now, you should know the two setups I’m talking about. That’s right buddy, two great opportunities to short at the PWH and top WATR! In fact, the first setup gave us some tweezer tops, while the second test formed a doji and another reversal candle! Not to mention, the resistance area lined up with the top falling trend line of a descending channel, while Stochastic was showing overbought signals! Money in the bank, baby! We could have gone short at around .8785 and went with a tight stop of 30 pips, putting it above the .8800 handle. The resistance-turned-support level at .8720 would have been an ideal profit target and by the end of the week, we would have had two 2:1 winners. High four (I only have four digits!) to you if you took these setups on EUR/GBP! 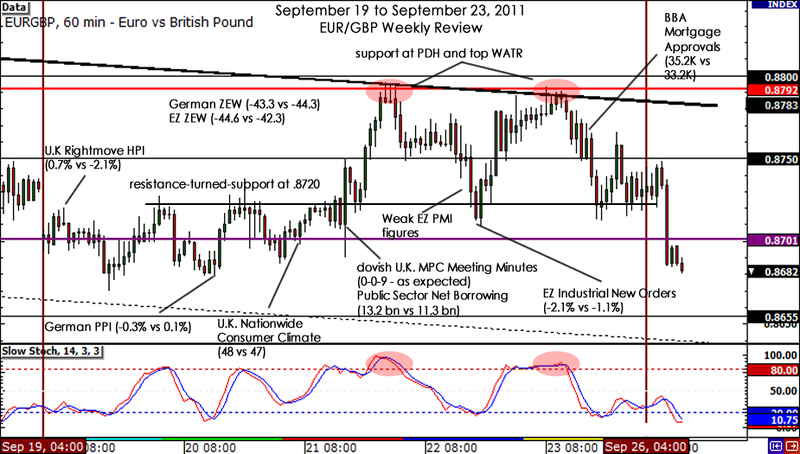 Did you make any pips trading EUR/GBP last week?